Note: Fahed Boukadous – tunisian journalist jailed for his coverage of the social protest movement in Redeyef, Tunisia in 2008, whose situation was decribed in this blog – has been freed today………news just came in. We truly thank you very much for your collossal support, to the Cause of the tunisian people . After Don Corleone’s departure last friday, the course of events followed up too fast, and it was almost impossible to keep up with the volume of information scattering in all directions, confirming the fall of the Regime , but also the increase of violence, the curfew, the historic scenes of the Interior Ministry the next day when the mass demanded the remaining heads of the Regime . Meanwhile appeared two idiots : Gannouchi and Mebazaa, to do their walk of shame and to totally misread article 56 and article 57 of the Constitution . A piece of clumsiness unheard of when coming from two most loyal coward slaves of Ben Ali, and two longest serving figures who collaborated with the Regime all along ! ! ! ? Nonetheless this Revolution had achieved its main objective : The System crumled and the Mobs fled like rats . The Tunisian Army takes all credit by acting conform the Constitution to eventually join the People’s side, which you and I both have speculated earlier on whether the Army would take its heavy responsability indeed . And yes, the Army must and should always be on the people’s side and we’re proud of their performance, and for standing tall in the face of the Regime, forcing ‘ ben ‘ AliBaba & his forty thieves to run for their lives . 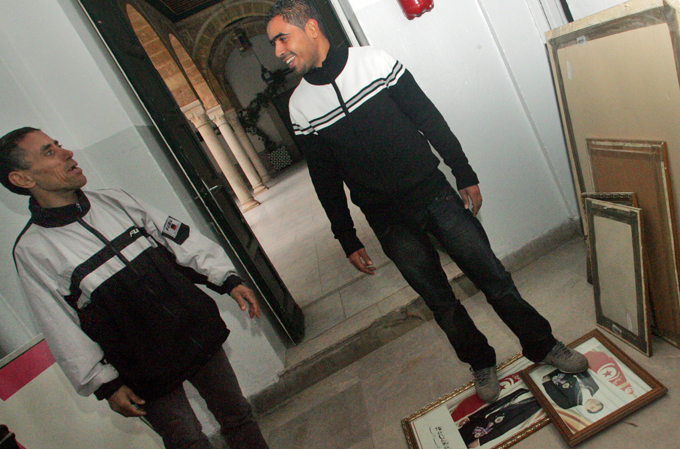 Many tunisians like me, are overwhelmed by a great sense of joy, the joy of liberation ! ! It had to be celebrated although, there is still a lot of work to be done, ahead of us . But I’m optimistic . you’re welcome kerym… although i suppose it’s not important, i would some day hope that i could meet you wherever it is you may be and we could continue our conversations in person. I definitely look forward to meet you some day, and to thank you personally too . I will certainly let you know if I’ll coming to the USA, probably in a few months time . It’ d be my very first visit to the US , it’s a trip I’ve always wanted to make, at least once in a lifetime !!! I intend to travel to as many states as I can, and will spend 3 to 4 weeks. depending on my budget and on how many vacation days I can afford . sounds like a great possible trip. if it does materialize, let me know… perhaps i can find some people to put you up along the way..
It’s very kind of you, professor Prince .